There comes a sense of urgency when something one wants cannot be easily located, the keys, a pen, directions, information, a person. This momentary loss of connection feels unstable, until what is being sought is discovered, retrieved, and stability resumed, panic averted. 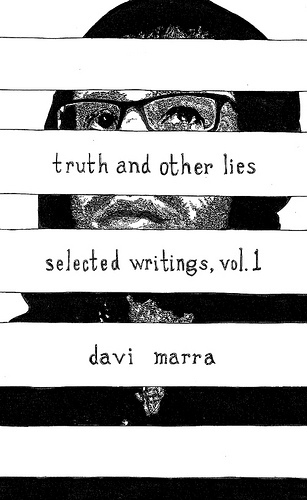 I happened upon Davi Marra’s truth and other lies: selected writings, vol. 1 at WORD bookstore. The slim volume felt right in my hand. I finished the collection quickly. While reading, it did not provide any immediate sense of urgency, more of a languid contemplation. As I finished and started researching the author it came to my attention no information was to be found. It began to feel urgent. In a time when finding a person, especially a writer, on the Internet is supposed to be a one-step task, this was not proving simple. Who was this author? Why couldn’t I find a Twitter bio, a Facebook page, a blog, a review, an outdated MySpace, a copy of the book for sale on Amazon, a Google Image. Where was the connection? While many of us try to falsely avoid loneliness by being omnipresent on the Internet, this author had made finding his information difficult. Imagine that. This led to no other conclusion than how easy it is to become incredibly reliant on the immediacy of information, both for reference and connection. Was this lack of accessibility intentional, a part of the image to go along with the many contradictions, the “truth and other lies” in the book? Or, perhaps Marra simply wanted to release his thoughts into the world and let them be found, let them become connected to the reader rather than the author. We sat and we talked then we laid and we fucked then sat up again and talked again and this time we didn’t lie. I got up and went to pee and you felt what my new room was like without me and you sat in the middle of my new life without me and you laid back and got up again and sighed before I returned. You smiled at my back as I shut the door quietly and I turned around and pretended not to see you your hungry tell-all eyes and came over to you where you sat on my bed and put my hand on your thigh and took it off and put it on my own. You put your hand on my thigh and stared down at your own and said that was nice. I put my hand on your thigh and said agreed and found your hand so interesting as it rested on my skin like it might contain all of you. Your fingernails were painted dark red and I asked want to smoke a cigarette and you said yeah is it okay to smoke in here. I said yes and removed your hand from my thigh with both of my hands but slowly and gently like a bandage. And hopped to the corner where my bag lay toppled and open and retrieved my pack of cigarettes as you tipped on your bottom reaching to open the window and swiveling to arrange yourself. We sat with our skin exposed to the cold smoking our cigarettes making no sound until you said I still love you you know and I laughed and said are you talking to me or your crotch and you looked up and your breath tripped and a tear came out of your right eye and caught the ceiling light and I stopped laughing and said your name. Then I said it again like a question. You inhaled sharply through your nose and the cats scampered and thudded outside my bedroom door and I said that sounds like my heart and you said my name like a question and looked down and shook your head and apologized and took my left hand in both of your hands and rubbed it with your thumbs as if it belonged to a corpse. I wanted to say I’m not dead yet then I remembered we’d stopped lying so I just smiled and said your name softly like an answer. Books turn into spectacles for numerous reasons. This is one of them.